The order has triggered protests from Sikh groups who want all Sikh women, including those who do not wear a turban, to be exempt from wearing helmets. Earlier this month, the Chandigarh Administration made it mandatory for everyone except a Sikh man or woman wearing a turban, to wear a helmet while riding a two-wheeler. The order has triggered protests from Sikh groups who want all Sikh women, including those who do not wear a turban, to be exempt from wearing helmets. Police have said their focus is currently on “awareness”, but they will “soon start fining violators”. On July 6, the Chandigarh Administration notified an amendment in Rule 193 (Use of Protective Headgear) of the Chandigarh Motor Vehicle Rules, 1990, replacing the blanket exemption for women with a narrower exemption restricted to “a Sikh person (including woman) wearing a turban”. The notification followed an observation by Punjab and Haryana High Court that road accidents “do not see the gender of the victim”. In December 2017, the court had taken cognizance of a plea by law researcher Anil Saini, seeking directions or guidelines on safety headgear for women, including Sikh women who do not wear a turban, in Punjab, Haryana and Chandigarh. Police records show that 24 women riders were killed and 85 injured in road accidents in Chandigarh in the two years up to December 2017. The Akal Takht, the highest temporal seat of Sikhism, and members of the Shiromani Gurdwara Parbandhak Committee (SGPC) are among those who have opposed the order, saying it goes against the Sikh code of conduct, which forbids wearing a topi. Akal Takht Jathedar (head priest) Giani Gurbachan Singh has said that no court or government authority has the right to define a Sikh. “A woman whose surname is Kaur and who does not trim her hair is considered a Sikh as per Sikh Rehat Maryada (code of conduct). Wearing a turban is not mandatory for her. However, on this ground, helmet cannot be made mandatory for her,” the Jathedar said in a statement. “A Sikh woman is a Sikh even if she does not wear a turban. Wearing a helmet or any other kind of topi or cap is a violation of Sikh tenets, and Sikhs cannot be forced to wear a helmet,” he said. SGPC member and president of the women’s wing of the Shiromani Akali Dal (SAD), Bibi Jagir Kaur has told The Indian Express that the order “hurts religious sentiments”, and that the Administration should have consulted religious parties before taking the decision. She intends to take up the matter with Chandigarh Administrator V P Singh Badnore, who is also Governor of Punjab. Gurpeet Singh, chief spokesperson of the Chandigarh-based Kendri Sri Guru Singh Sabha, a prominent Sikh social organisation, agreed there were “safety issues” involved, but insisted that “you cannot impose a law on the community when religion is involved”. Haryana exempts only Sikh women who wear turbans, from wearing helmets. In 2014, following protests against an order making helmets mandatory for women riding pillion, the Delhi government allowed Sikh women to ride pillion without helmets. Earlier, in 1998, the Punjab and Haryana High Court had exempted only “Sikhs wearing turban while driving”. 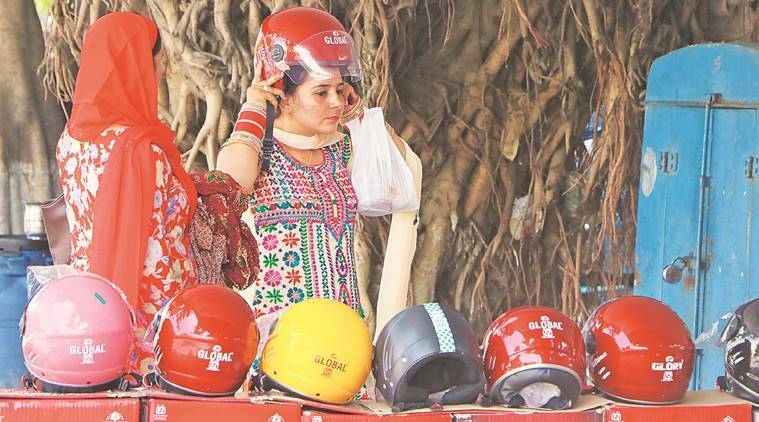 Following protests by Sikh women who said a helmet was a cap that symbolised slavery, the Chandigarh Administration appealed to the Supreme Court in 1999. In 2004, the court ruled that the state had the power to relax rules in a particular area, following which Chandigarh exempted all women from wearing helmets.